The fifth installment would be due during President Trump's second term if he's re-elected. "To better assess the potential future effects of climate change, we need to focus on improving the transparency and accuracy of our modeling and projections," spokeswoman Lindsay Walters said in a statement. "The Fifth National Climate Assessment gives us the opportunity to provide for a more transparent and data-driven process that includes fuller information on the range of potential scenarios and outcomes." The White House claim that "the report is largely based on the most extreme scenario" is false, said Katharine Hayhoe, an atmospheric scientist at Texas Tech University. "I wrote the climate scenarios chapter myself so I can confirm it considers ALL scenarios, from those where we go carbon negative before end of century to those where carbon emissions continue to rise," she wrote on Twitter. "What WH says is demonstrably false." Several of its authors say the National Climate Assessment was rushed to release weeks before it was to be unveiled at an annual conference of the American Geophysical Union. Instead, the Trump administration dropped the report on the afternoon of Black Friday, a period when politicians infamously dump news that they don't want to garner attention. The report's release surprised even its authors and came shortly after Trump inaccurately tweeted that cold weather on a single day disproves the theory of climate change. "Whatever happened to Global Warming?" Trump asked. 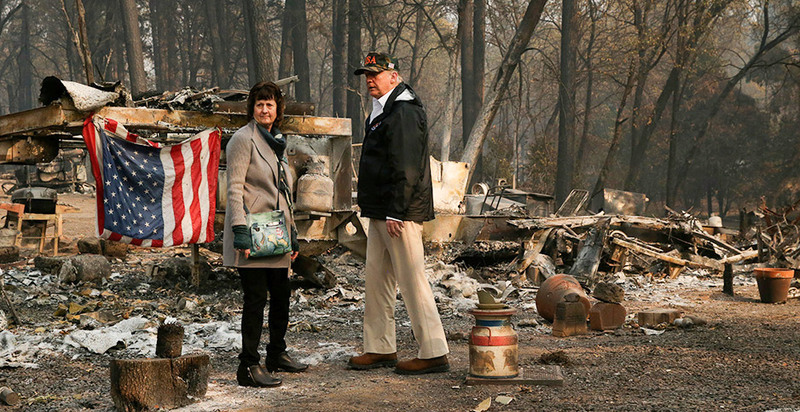 The report is a powerful rebuttal to several of the claims made by Trump or administration officials in the wake of California's most destructive wildfire, which has killed more than 80 people and burned 14,000 homes. Trump has argued that "raking" forests would mitigate wildfire risk, and Interior Secretary Ryan Zinke has backed up the president's assertions, claiming that poor forest management was the real risk — not climate change. "The area burned by wildfire from 1984 to 2015 was twice what would have burned had climate change not occurred," the authors state. On the "Fox News Sunday" program, Sen. Ben Sasse (R-Neb.) criticized the "alarmism" of those who say climate change is a severe threat and said reasonable people can disagree on "how much and how rapidly." "What the U.S. needs to do is participate in a long-term conversation about how you get to innovation, and it's going to need to be a conversation again that doesn't start with alarmism," Sasse said. "But that starts with some discussion of the magnitude of the challenge, the global elements to it and how the U.S. shouldn't just do this as a feel-good measure but some sort of innovative proposal." On "Meet the Press," Sen. Mike Lee (R-Utah) acknowledged that fossil fuel consumption can harm the planet but said he was waiting to hear climate policy proposals that did not harm the economy. "All the proposals I've seen so far that would address any of these issues would devastate the U.S. economy and have little or no benefit that is demonstrable from our standpoint," he said. "And so I have yet to see a proposal that would bring this about. I think if we're going to move away from fossil fuels, it's got to be done through innovation. And innovation can be choked out through excessive government regulation." Democrats said the report shows that addressing climate change must become a priority for next year's Congress. "All hope is not lost, but we must act now," said Rep. Eddie Bernice Johnson (D-Texas), the expected new chairwoman of the House Space, Science and Technology Committee, in a statement. "We have to reduce greenhouse gas emissions, work on adaptation and mitigation, and explore technology solutions such as geoengineering and carbon capture and sequestration," Johnson added. "That is why I have made climate change one of my top priorities for the Committee going in to the next Congress." "People are going to die if we don't start addressing climate change ASAP. It's not enough to think it's 'important.' We must make it urgent," she tweeted. "That's why we need a Select Committee on a Green New Deal, & why fossil fuel-funded officials shouldn't be writing climate change policy."